This place is the stage for one of NASCAR's biggest soap operas, and after a rather dismal 2012, things can only look up for the guys at Richard Childress'. Yes, all the focus on the grandkids, Austin and Ty Dillon, may be a distraction. 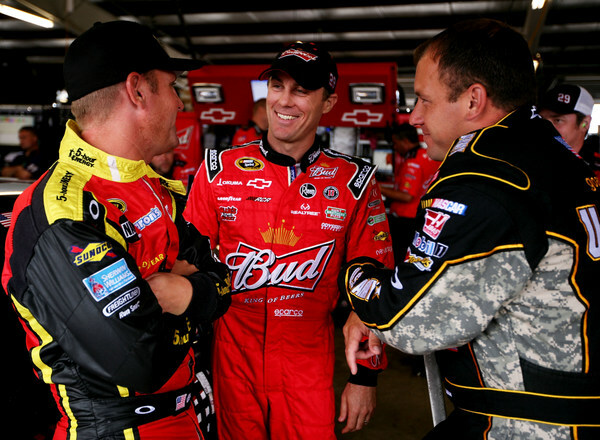 Yes, the continuing saga surrounding Kevin Harvick will again be in play, this being his lame duck season before moving to Tony Stewart's team for 2014. Yes, it was a winless 2012 for Paul Menard and Jeff Burton, and Kevin Harvick didn't get on the scoreboard until that wild Phoenix race the next to last week of the season...ironically the same weekend the news broke that he would be leaving Childress at the end of 2013. That, after a topsy-turvy 2011 may put a cloud over happy talk. And, yes, you may need a scorecard to keep track of who is crew chief for whom. But like Gil Martin says "Kevin thrives on such aggravation. So I think it's going to be good for us." 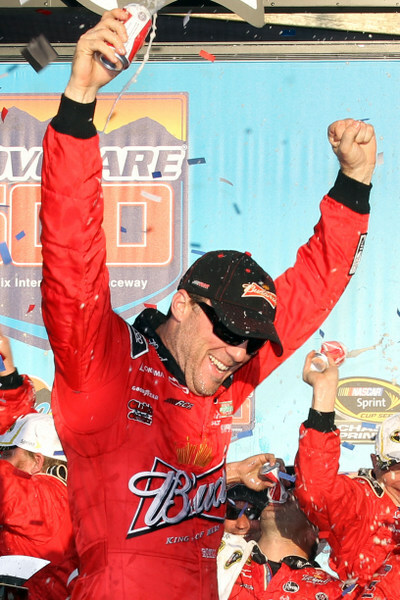 Martin, after leading Harvick to strong title bids in 2010 and 2011, was abruptly dumped by Harvick the final weekend of the 2011, in a not very pretty turn of events. Harvick wanted Shane Wilson as his crew chief, and that's what Childress set up...only to find that it simply didn't work that well. So as 2012 went along, Childress put Martin and Harvick back together. And that's the way they'll start 2013. "I think it's all going to work to our advantage, because we all know each other well," Martin says of his final season with Harvick. "I know it's going to motivate him and it's going to motivate us. "It's been a good off-season for us; we just had two of the best tests we've had together in 10 years. "He thrives on this kind of stuff. He drives better in that state. He's one of the few drivers who can focus while he's agitated. "And me, I'm immune to everything by now. In fact I'm looking forward to this." The new 2013 models, Martin says, look great. Of course such positivity is the NASCAR company line, with so many hoping the new cars will somehow lead to a turnaround in this sport's fortunes. There is a decided shortage of new car body parts. Teams are on short rations. And until a good run of new sheet metal starts arriving, drivers better not do much wrecking. 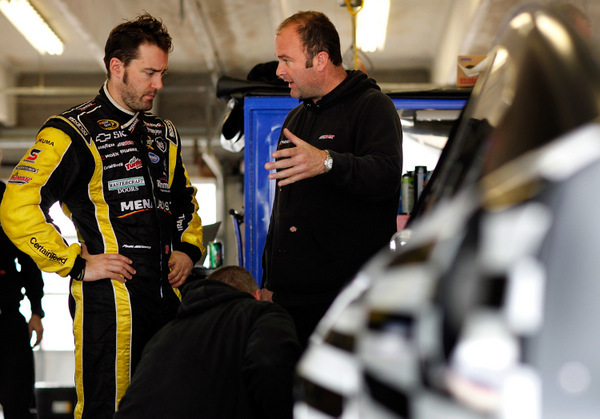 "In fact we're on 'wreck management' this week," Slugger Labbe, crew chief for Paul Menard, says. "Every point counts, so 'crash repair' is important." Why such a delay in new body parts? Because last summer, NASCAR execs were still hoping to keep Dodge on the track. And the prototype 2013 Dodge was, well, not nearly as up to speed in design as the Fords, Toyotas and Chevrolets. So NASCAR told Ford, Toyota and Chevy teams basically to 'dumb down' their own 2013 designs, to keep open the Dodge option. And when Dodge execs finally said they were pulling the plug on NASCAR, the other three car makers went back to work...albeit months behind where the 2013 project should have been. "Dodge is unfortunately out of the sport...and that slowed things up a little," Labbe concedes. "Everyone spent a lot of time and money (last summer) making their cars equal to the (slower) Dodge. "Dodge wasn't up to snuff on downforce in the wind tunnel, compared to the other three. And we all had to make our cars 'less efficient,' make our cars unbalanced, take downforce out of our cars. Bottom line: teams are still playing catch-up. Last Friday's test here, a late call, and a rain/snow-shortened test, was the first time many drivers actually had a real steel-bodied race-ready mid-sized-track car to drive. Crews are having to bite their tongues when pressed about how far behind this entire project is. The first 1-1/2-mile race is at Las Vegas in just a few weeks. And Martin says right now he has only one Las Vegas car race-ready for Harvick. And that doesn't even bring into account the Goodyear factor. The tire supplier is under heavy pressure to make for better racing by providing softer tires, though boss Stu Grant says it's simply not that easy. Whether or not the tires Goodyear may have for Phoenix and Las Vegas and California will match up well to the new downforce with the 2013s is up for debate. Labbe and Menard will be going to Darlington Raceway Feb. 5th to do a tire test for Goodyear, which should be an interesting indication of what to expect. Hence the question is how much crashing should teams be braced for early in the season...and how conservatively will drivers thus be racing? Seldom if ever has a NASCAR season opened with so many things still up in the air. "You're hearing talk about carbon-fiber deck lids and carbon-fiber hoods and 'how will they react when you hit the wall and crash?'" Labbe says. "So we're preparing this week for how we'll fix these cars. This is 'crash repair' week. We're not testing, we're here this week working on simply crash repair. "The good thing about Paul is he doesn't typically put himself in a bad situation. He's smart and meticulous behind the wheel. "Sometimes he's too cautious. But at the end of the day, his wheels are usually still turning. "Paul doesn't get many DNFs." Fixing these 2013s may be more difficult than fixing the 2012s. "They've given us more templates, really they've added a template between every template," Labbe says. That is part of the fallout from the Chad Knaus C-post controversy last season. "It's our job to create rules," Labbe says with a grin. "And it's theirs (NASCAR's) to enforce them." Labbe says he's got three Daytona cars ready for Menard. "And we plan on using all three. You have to be prepared; you win races here in the shop, and there's no reason to go to Daytona with only two cars. Because you know there's a chance you may use all three; we did last year. We totaled two cars prior to the 500." Labbe insists NASCAR has done a great job keep Ford, Chevy and Toyota equal in body styling. "So it's going to come down to who has the better engines, the better driver, and the better pit crew." And who has the better car manufacturing assembly line in-house. And Labbe is not alone in praising NASCAR for keeping an open mind about much of this 2013 project. It used to be NASCAR's way or the highway, but with the 2013s teams are finding much more open communication with officials. Still the problems this sport has been saddled with the past two years don't logically appear to be that easily resolved just by new hardware. "To me it's just neat to see how these new cars have evolved," Labbe says. 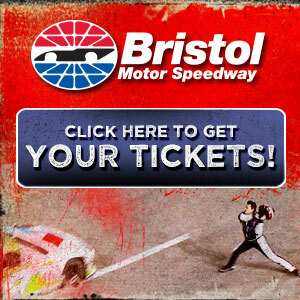 "We did the first test at Martinsville, and these cars have really come along, and that's because NASCAR has been working with the teams to make this car better, so we can put more fans in the stands. "I remember when we went to Texas to test this car (last fall). We had hardly any 'splitter' on the front and only a four-inch spoiler. Now we have a two-inch splitter in the front and a 7-1/4-inch spoiler....which gives us a tremendous amount of downforce. "And everywhere we've gone, the speeds have been through the roof. Charlotte speeds were tremendous; Texas we ran laps at pole speed. The speed is there, the cars are making downforce, and downforce is grip. And the more grip you have, the more gas you can put to the floor." And what do Goodyear men Rick Campbell and Stu Grant think about all this? "They're scratching their heads like you," Labbe said with a laugh. "The good thing is these cars are more aerodynamically balanced than we had last year. So we're not really punishing one tire more than another. So it might be a breath of fresh air for Goodyear. 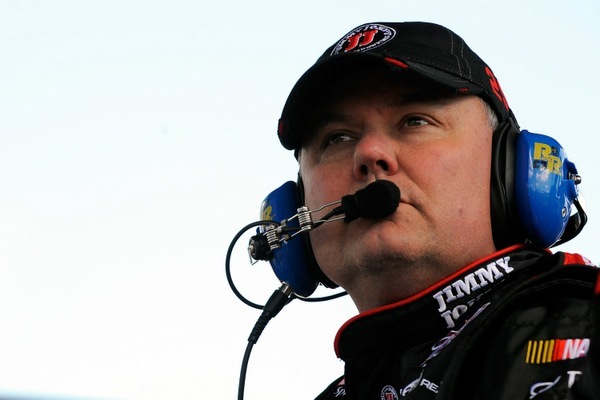 "NASCAR has been more open and receptive to the people who work on these cars. You have to understand that our sport is engineering right, and very technical. NASCAR understands we have them outnumbered in engineers; so they're listening to the smart people on our race teams so we can have a better product, to keep people in the grandstands. "We've got a lot of cars still going through the system, about 90 percent finished, and we're still waiting on some parts and pieces. But nothing that will keep us from closing the doors in two weeks and going racing. "It's like when the car-of-tomorrow first came out (in 2007), and we hated it and we fussed and complained...and went to work. When EFI (electronic fuel injection) first came out (last spring), we all fussed and complained and griped and moaned, but we made it work. "We've been complaining about having no deck lids (with the new cars)....but we'll all be in Daytona. "It always works its way out. "We're just not used to having such little (car) inventory right now. But when we come back from Daytona, we should have a fair fleet of race cars here in the shop."